Check tire pressure at least once a month. Tire with the best conditions can lose 1 to 2 psi pressure per month. For passenger vehicle such as sedan, usually the size of tire pressure instructions listed in the driver's door frame. 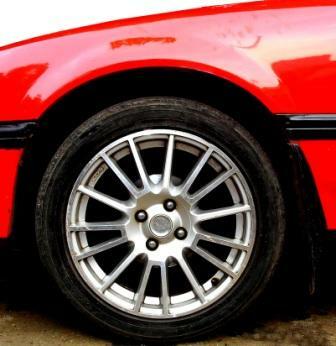 Tire pressure for the front wheel is usually 32 psi (221 kPa; 2.2 kg/cm2) and the rear wheels 30 psi (207 kPa; 2.1 kg/cm2). On truck and bus tire pressure reaches 60 psi. For the large trucks used in mining, tire pressure reaches 105 psi. Please refer to the manual of your vehicle. Tire pressure is not determined by the type of tire, but by the weight of the load and vehicle applications. If the vehicle used to carry heavy loads or with full passengers, in general, the pressure must be increased by 4 psi. Underinflated tire will make greater friction, causing heat and wasteful fuel consumption and higher wear occurs. Vehicle control will also be less stable so that it can cause accident. Underinflated tire usually suitable when driving on mud or sand, as underinflated tire has wider contact and softer when touching muddy or sandy ground. Overinflated tire would be uncomfortable to drive and can explode. Generally, do not pump tire up to exceed 40 psi, refer to your tire specification. If the vehicle is running for several kilometers at high speed, tires temperature will rise to about 4 to 6 psi higher than when cold or before run. This is normal, you do not have to reduce it. In general, any change of 10oF (5.6°C) ambient temperature will change the tire pressure 1 psi. So if the temperature changes from summer to winter which can occur -50oF (-28oC), the tire pressure will decrease by -5 psi, which will greatly affect vehicle handling, traction, fuel consumption, and tire wear. As quoted from Wikipedia: according to GITI, 10% reduction in tire pressure, will increase fuel consumption by about 1%. So if the pressure on four wheels down by 10% then the total will be 4% more fuel consumption. 10% reduction in tire presure can be happened in a month or less. If you consume 100 liters a month, with underinflated tires it will be 4 liters more fuel consumption. Since the inspection and pumping tires only cost about the same as 1 liter of fuel price, sometimes even free, it is clearly more advantageous if you check tire pressure at least once a month. Of course the difference in fuel consumption will be much higher with more number of tires and more mileage for vehicle such as truck and bus. Incorrect tire inflation pressure will lead to higher maintenance cost and downtime. According to DEKRA, German safety organization, 41% of accidents with injuries is associated with tire problems. Today trend is to use large wheels combined with a low-profile tires. Low profile tires have a short or low wall and a wide tread, sometimes called high-performance tires. This type of tire used on high-speed vehicles because it is more stable and has better traction. Usually low profile tire loses pressure more often due to smaller gas volume inside the tire, so tire inflation pressure on low profile tire should be checked more frequent. But considering the price of nitrogen is still quite expensive, it is more profitable if you buy a tire pressure gauge and fill your tires with air regularly. Make sure condensation water (dew) is always drained from compressor tank to ensure minimum water vapor is pumped into tire.